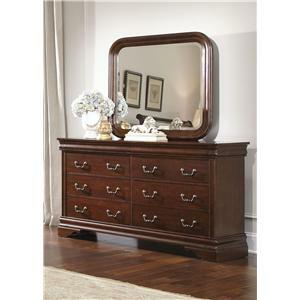 Pair this dresser and mirror for a bedroom piece as functional as it is beautiful. 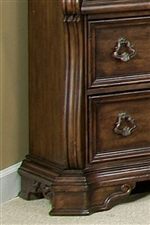 Offering sweeping traditional elegance with shaped pilasters, rope twist moulding,and ornate burnished brass hardware, the dresser sets the stage for a distinguished and time-worn bedroom atmosphere. The coordinating mirror, featuring dramatic scrolled burnished brass inserts, contributes depth and dimension to the set. 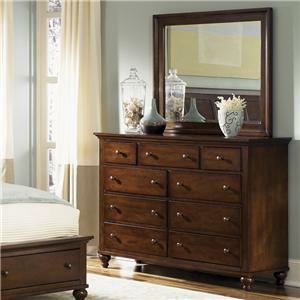 Together, this dresser and mirror offer everything you need for a smooth morning routine, storing your clothing and accessories while providing a convenient changing station. 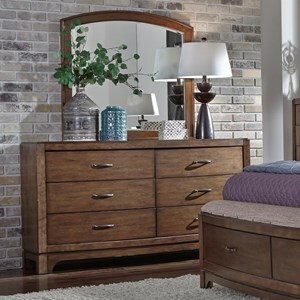 The Arbor Place 8 Drawer Double Dresser and Landscape Mirror by Liberty Furniture at Thornton Furniture in the Bowling Green, Alvaton, Glasgow, Scottsville, Franklin area. Product availability may vary. Contact us for the most current availability on this product. For a time-worn elegance and unmistakable refinement, choose the Arbor Place collection. Pieces from Arbor Place showcase sweeping outlines and intricate shaping, presenting a distinct traditional look perfect for your home. Signature scrolled burnished brass inserts appear on the sleigh headboard and landscape mirror. 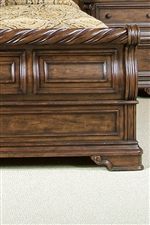 All case pieces feature shaped pilasters, scrolled bracket feet, rope twist detail, and step moulding. 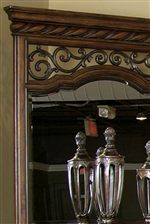 The china cabinet top features an intricate decorative vine motif. Dovetailed drawers on full-extension metal glides are adorned with burnished brass drop-ring and knob hardware. Mix and match Arbor Place pieces for a stunning traditional home setting. 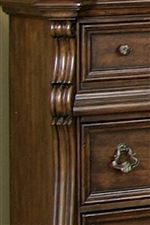 The Arbor Place collection is a great option if you are looking for furniture in the Bowling Green, Alvaton, Glasgow, Scottsville, Franklin area. 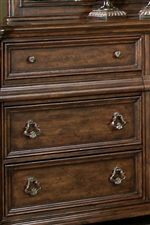 Browse other items in the Arbor Place collection from Thornton Furniture in the Bowling Green, Alvaton, Glasgow, Scottsville, Franklin area.